There’s more to do in the Maldives than just admire the view from your water villa—and crafting a bespoke itinerary is the perfect way to make the most of this far-flung, tropical destination. Twin your stay with a separate excursion to mainland India, explore the Maldives’ active side, or scope out the very best diving spots—we’ve picked 10 inspiring ways to explore the Maldives that will transform your time away. The Maldives offers a wealth of destination-worthy, five-star resorts—so why stay at just one? Depending on the duration of your trip, split your getaway between two (or more) hotels—preferably ones that are located in different atolls—so you can see as much of its incredible scenery as possible. There’s plenty of opportunity to explore different locations in the Maldives—even on short stays. If Malé is your base, you’re perfectly situated to set off on a day trip. A number of beautiful islands are only a speedboat trip away, so you can explore even during the briefest of getaways. One advantage of visiting the Maldives? The opportunity to twin your trip with other spectacular destinations. Sri Lanka, say, where you can counterpoise your Maldives beach relaxation with a retreat into the teardrop-shaped island’s mist-shrouded tea estates. The Maldives’ incredible hospitality offerings mean you can zero in on a hotel or resort that perfectly pairs with your interests. Love nothing more than a spa pampering? Book the Como Maalifushi. Class yourself as a foodie? The Taj Exotica hosts a number of exquisite bars and restaurants. And if privacy is what you crave, get away from it all at the Gili Lankanfushi. The Maldives are also a quick flight away from South India, so if you’re feeling intrepid, a visit to Nagarhole National Park is a must. Located outside of Bangalore, it’s home to tigers and other exotic species, and offers superlative safari explorations. 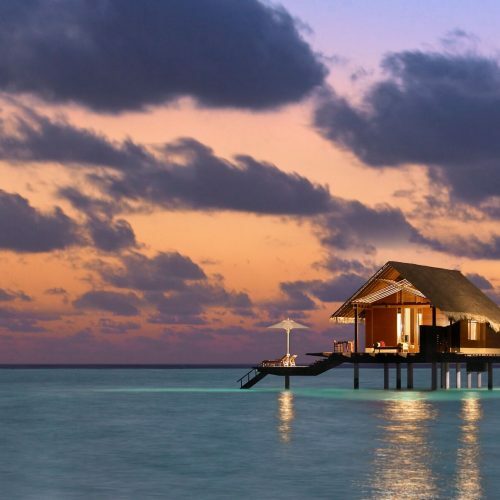 There is absolute luxury in being able to leave all the planning and details of your holiday to someone else—and with a stay at a high-end, all-inclusive resort in the Maldives, you can drink in the ambiance without worrying about the logistics. The Vivanta by Taj—Coral Reef offers a sublime, five-star experience. For a memorable way to explore the Maldives, take to the water and spend the night on a luxury liveaboard. These high-end vessels don’t just promise plush accommodation—they also whisk you directly to some of the country’s best dive spots. Speaking of diving: if you’re serious about your underwater forays, then follow our advice and book in at the Constance Moofushi in the South Ari Atoll. Located near one of the world’s best diving spots, it’s the perfect way to discover the wonders of the Indian Ocean. If snorkelling through crystal-clear waters is at the top of your Maldives bucket list, then you can also consider booking a stay at a hotel that has its very own ‘house reef’—like the Vivanta by Taj—Coral Reef or Huvafen Fushi—for the ultimate ease of exploration. Sunning yourself on the sand is one of life’s purest pleasures—but if you like your holidays with a more active kick, then a stay at LUX* in the South Ari Atoll offers the best of both words. With tennis courts, beach yoga, cycling, and one of the largest selections of water sports available at any of the Maldives’ five-star resorts, you can enjoy paradise (but still break a sweat).